Volunteers have played a major role in the work of Friends of Loch Lomond & The Trossachs over the last 35 years. We have stepped up our volunteering activities in recent years to try and make a real difference. There are a range of interesting and enjoyable volunteering opportunities available for people with a wide variety of different skills and interests. Below is a list of some of the volunteer opportunities available in 2013. We are also open to suggestions for other activities from potential volunteers provided they are in line with our aims. Make a Difference Days -Fun conservation in action events throughout the National Park tackling a range of tasks including clearing litter on beaches and the Loch Lomond islands, creating habitat areas, clearing paths and cycleways, planting trees and helping children to enjoy adventure days out. Help at Shows and Events- Each year we look for volunteers who are keen to spread the word about Friends of Loch Lomond and The Trossachs and help staff our stand at the various Highland Games, agricultural shows and and other events we attend. The role involves talking to the general public about our work; handing out information to those interested and encouraging them to become a member; and selling the Friends publications and merchandise. Kilt Walk(April)- If you are a keen walker why don't you sign up as a Friends partner and take part in this fundraiser which aims to support a series of young Friends projects. For the more energetic there are opportunities to participate in the full 26 mile walk from Hampden to Balloch or the shorter walks from Bowling to Loch Lomond (13miles) or twice around the Balloch Country Park. There are also less challenging opportunities such as helping tickets for our prize draw at Loch lomond Shores to some of the thousands of participants and followers. 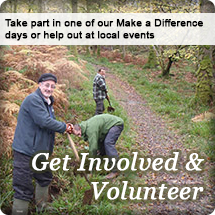 Caledonian Challenge (June)- We provide volunteers to marshall at this event on the West Highland Way. An enjoyable event to help out with and in the process generate much needed funds for the Friends to support our work. We are paid £100 for every volunteer who spends an eight hour shift marshalling either cheering on participants or helping to direct support vehicles in car parks. Help in the Office- Volunteers are needed to help us with a range of tasks including members mailings, stocktaking and sales of cards and other merchandise. Help pack our Voice magazine as part of a team of volunteers or help out with other enjoyable tasks to further our work.